Keeping It Stylish in the City! This summer, its all about thinking outside the box when it comes to causal. We love one of this seasons hottest looks; the out of the bedroom lingerie tee, paired with classic distressed jeans, a chunky heeled open toe sandal and this great statement bag. CitySTYLE – Fun, Fashion, Fabulous! Cynthia, LaToya & Fauna are summer ready! 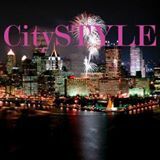 Trying to get in touch with CitySTYLE?